We are locals who stayed one night to simply take advantage of the hot tub (to relieve some stress). Everything about the cabin was charming & comfortable. Location was great for us. Close to Pigeon Forge (8 minutes), but off the beaten path. Only complaint was the hot tub did not get nice & hot. It got nice & warm, but not hot. We would recommend staying with Cloud 9. We celebrated our first anniversary here, and I foresee future stays. The cabin was clean and comfortable, and the Christmas tree was such a surprise. We were happy with the amount of clean towels and bedding and the overall ambiance of the cabins charm. The hot tub was such an added bonus and relaxing after the hours spent shopping. Speaking of shopping, everything was within minutes and so handy. We really appreciated all of the little details, extra trash bags, soap, clean and ready-to-go outside grill. Overall, it was an awesome experience and we will be returning, hopefully in the near future. The worst things about our stay was the rotten egg smell of the water. Made it hard to wash your face and brush your teeth. Even with that said, Over all satisfied! The cabin has a secluded feel to it, even though there are other cabins nearby. The bed is really soft(not in a good way) with pillows to match. The fridge door does not open all the way as it’s too big for the space it was put in. I’m not sure if shampoo is supposed to be provided, since we were only given hand soap. We had no water in the cabin on our third day, we called the office around 9 am. The office person told us he would text us when water was back on. By 4 pm no text so we decided to go back to the cabin, as we were tired of using public restrooms. That was very frustrating! Overall we did like the cabin. Very cozy lil tiny house type cabin. Close enough to town yet have the secluded woods feel. Wonderful hot tub(like the best one I’ve ever been in). The property was very clean and all the staff has been super helpful. We did have the unfortunate event of pipes freezing our second to last day and without hesitation we were moved to another cabin “Bearadise” which was gorgeous. Will definitely use Cabins USA for future stays. We absolutely loved this cabin!! The staff when checking in were extremely polite and the check in packet we received with info from a local was the best. We will definitely be back and stay again. Everything was amazing, the Cabin was beautiful (minus a few small details that were easy to ignore) and very comfortable, me and my husband even to tried to figure out where they bought the blanket. The hot tubs lights didn't work but that we could simply ignore as well and it was so close to the local shops. We will defiantly be staying here again! I am so happy to hear that you enjoyed your stay in Cloud 9! We here at Cabins USA strive to make sure each of our guests have the best stay possible while vacationing in the Smokies. 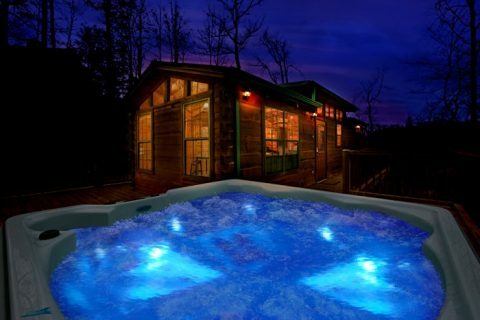 Thank you for letting us know about the hot tub lights. Your comments have been forwarded to our maintenance department to be addressed. When you are ready to stay with us again, please mention you are a return guest for an additional discount. Thank you for choosing Cabins USA and we look forward to seeing you again soon! but by the time time they added all the fees and taxes it ended up costing around $125 per night. All together it was nice. We had a very enjoyable stay at cloud 9. The only issues we experienced were the lights in the hot tub didnt work, the kitchen pantry door was completely off its frame and fell over when we tried to open it, the sliding glass door latch needs tightened back to its proper position and the blinds on the sliding glass door are falling apart but these are all minor complaints and did not really affect our stay much. I took a walk-thru video of all the exisiting damages to the cabin such as some knicks in the fireplace mantle,the blinds, the pantry door and the deteriorating hot tub cover just to make sure we arent charged for any damages but overall the property is very nice and we wished we owned it! Thank you for taking the time to let us know about your recent stay in Cloud 9. We here at Cabins USA strive to give each of our guests the best stay possible while vacationing in the Smokies. I apologize for the issues you experienced during your stay. Your comments have been forwarded to our maintenance department to be addressed. When you are ready to stay with us again, please mention you are a return guest for an additional discount. Thank you for choosing Cabins USA and we look forward to having you as our guest again soon! The head of the bed tilted lower the the foot of the bed made sleeping rough. There was no room to walk in between bed and wall. There were also no night stands in the bedroom to set stuff on. I use a c-pap machine at night and had no where to set it except on the floor. Thank you for taking the time to let us know about your recent stay in Cloud 9. We here at Cabins USA strive to give each of our guests the best stay possible while vacationing in the Smokies. I apologize for the issues you experienced with the bed. Your comments have been forwarded to our maintenance department to be addressed. When you are ready to stay with us again, please mention you are a return guest for an additional discount. Thank you for choosing Cabins USA and we look forward to having you as our guest again soon! We stayed for the weekend, everything was great, the location was close but secluded from the attractions. The only problem that we were concerned about was the lock and the door frame. It was a little sketchy, looked like someone may have attempted to tamper with the door frame. Not sure if its been like this before we stayed. Definitely made us feel a little uneasy. Other then the door lock we enjoyed our stay. Thank you for taking the time to let us know about your recent stay in Cloud 9! We here at Cabins USA strive to give each of our guests the best stay possible while vacationing in the Smokies. Thank you for letting us know about the condition of the lock and door frame. Our guests' safety and peace of mind are of the utmost importance. Our maintenance department has been notified and will be addressing the situation. Thank you for choosing Cabins USA and we look forward to having you as our guest again soon! Very nice place and was very cozy. It was peaceful and quiet and made for a very relaxing weekend. A couple of small complaints: Only two large plates in cupboard and not much silverware. Bathroom walls and corners were very dusty. Bathtub did NOT drain well. Thank you for taking the time to let us know about your recent stay in Cloud 9! We here at Cabins USA strive to give each of our guests the best stay possible while vacationing in the Smokies. I apologize for the issues you experienced during your stay. Your comments have been forwarded to our maintenance and housekeeping departments to be addressed. When you are ready to stay with us again, please mention you are a return guest for an additional discount. Thank you again for your review and thank you for choosing Cabins USA! Just to let you know the blinds were broken. The rocking chairs were broke and the hot tub was leaking. If we had brought more people there wouldn't have been enough dishes. Thank you for taking the time to let us know about your recent stay in Cloud 9. We here at Cabins USA strive to give each of our guests the best stay possible while vacationing in the Smokies. Thank you for letting us know about the blinds, rocking chairs, and hot tub. Your comments have been forwarded to maintenance to be addressed. Thank you for choosing Cabins USA and we look forward to having you as our guest again. I found the cabin to be fine, however I did not like that the front door frame was damaged, which did not give security to the door. I could never connect to the wireless network of the cabin and felt that the outside areas were not completely clean. Anyway considered an excellent experience the stay in their cabins. The cabin had no WIFI but was suppose to as listed. Thank you for taking the time to let us know about your recent stay in Cloud 9! I apologize for any issues you experienced with the Wi-Fi during your stay. Your comments have been forwarded to our maintenance department to be addressed. When you are ready to stay with us again, please mention you are return guest for an additional discount. Thank you again for your review and thank you for choosing Cabins USA! Could have been cleaner. The carpet needs replaced. Loved the location. Had everything you could need. We booked Cloud 9 for our honeymoon trip. It was perfect for the two of us. It was close to town, yet quiet and very wooded. We loved that there was a gas grill on the patio! The kitchen was stocked with dishes, a toaster, and a coffee pot (bring your own filters). We were extremely happy with our stay! We loved the simple check in. Didn't even have to go to office, and that worked out great considering the car show that backed up traffic for miles. The directions were great, and found it with ease. Our initial thought of the appearance of the property was good. Deck was not kept up with as far as pressure washing, or stain. The inside of the cabin all in all was pretty clean. Couple minor thing's was kinda annoying, like screen door handle broken, which made getting it open a little harder, and the jagged metal around the bolt holes wasn't making it easy to open. The slats on the sliding door blind would fall off every time you opened them, cause they were being held on by tape at the top in the prongs. The remote for the direct tv wasn't programmed to the tv in the living room, which we just watched a DVD, but bedroom was fine. The carpet was very dirty, and wouldn't walk barefoot on it. As far as outside the lighting on the deck was very poor. It barely worked. The cabin's outside light's worked just fine, but would be better if more light was provided. The lights on the hot tub didn't work at all. It still was very relaxing after a few hours when the temp went up. All in All I would stay again with Cabins USA, but not in that cabin unless improvements would be done. You pay that much for 2 night's, I expect more out of the return. Customer Service was good. They did make a call to make sure we were ok, but I missed it do to being at dinner, and not hearing the call over the restaurant noise. I did try to return call, and got put on hold, and transferred twice, then hung up on. The internet doesn't work well or at all. I apologize for the issues you experienced with the internet. Your comments have been forwarded to our maintenance department to be addressed. When you are ready to stay with us again, please mention you are a return guest for an additional discount. Thank you for choosing Cabins USA and we look forward to having you as our guest again! Nice place. Did not like location. Carpets need to be cleaned. Otherwise it was a nice tiny home. Thank you for taking the time to let us know about your recent stay in Cloud 9. I apologize for the issues you experienced with the televisions, but am happy to hear everyone enjoyed using the hot tub. When you are ready to stay with us again, please mention you are a return guest for an additional discount. Thank you for choosing Cabins USA and we look forward to having you as our guest again! I really enjoyed my stay at Cloud 9; even with the wake up call each morning from the beautiful peacocks. The lighting near the hot tub was out; but overall it was a great stay away from home. The check-in process was quick and simple and the staff was friendly and helpful. We booked this cabin for our family spring break trip. We decided last minute to book a cabin over doing a hotel room and this was the only one bedroom cabin available at the time. It worked for what we were needing, however, it was quite small and just didn't feel like enough room for the 4 of us. I will say that the cabin was clean and had nice flat screen TVs with all of the movie channels and DVD players. The lights on the hot tub did not work and that was kind of a bummer as we used the hot tub almost every night. There were also a lot of bees which made spending any time on the deck not so enjoyable. The most unique thing about this cabin was that there were 2 male peacocks that would show up every morning around 8:30 am and they would hang out all day. I'm not sure where they live on the property but they like this cabin for some reason!! Kind of cool but kind of annoying in the morning as they have aloud wake up call! Thank you for taking the time to let us know about your recent stay in Cloud 9. Thank you for letting us know about the bees at the cabin. Maintenance has been notified and will be correcting that issue. When you are ready to stay with us again, please mention you are a return guest for an additional discount. Thank you again for your review and thank you for choosing Cabins USA! Ok, this is a fantastic cabin, unless of course you are accustom to your four bedrooms four bathrooms home! The cabin is small but cozy, we loved it. My kids (6 and 9) loved the tinny space with their own monitor and dvd, plus they were watching the living room's TV from there, and we all loved that the cabin was decorated for Christmas. Unfortunately (or fortunately) the were no snow (maybe the warmest Christmas ever). I'm not sure but if there were any snow it may have been difficult to reach the cabin without 4WD car and maybe snow chains, my Chevy Tahoe was big to maneuver and I wonder how it would work with snow, so be prepared. The cabin is almost isolated in the woods but yet so close to everything! Just a couple minutes away from Tanger Outlets, Walmart, IHOP and all the Pigeon Forge attractions. So you can enjoy both the woods sounds (there is a little stream running lower, and few squirrels playing around), but also the stores and dinning places in the "civilization". The cabin had almost everything you need, although I have to say a couple of pillows and a dinning plate were missing but no problem at all. The grill needs to be serviced and cleaned, so either bring with you some cleaning solution or some aluminum foil, and a lighter. As I read in a former review and proved to be correct there was a tipping envelop for the cleaning lady, never showed up, not even to pick the trash. Anyway, overall I loved the cabin and I do strongly recommend it. Thanks Cabins USA. Thank you for taking the time to let us know about your recent stay in Cloud 9. We here at Cabins USA work hard to make sure that each of our guests have a memorable stay while vacationing in the Smokies. I apologize that it was not explained that you have to call our main office for a trash pick up. We are working with our guest service agents to make sure future guests are aware. When you are ready to stay with us again, please mention you are a return guest for an additional discount. Thank you again for your review and thank you for choosing Cabins USA! We enjoyed our stay in the cabin. The location was great just far enough out to be away from the hustle and bustle. We will for certain be using the rentals again. Thank you for all of your kind words! We here at Cabins USA work to make sure each of our guests have the same great stay you enjoyed while vacationing in the Smokies. When you are ready to stay with us again, please mention you are a return guest for an additional discount. Thank you again for your review and we look forward to having you as our guest again! Thank you for all of your kind words! We here at Cabins USA work hard to make sure that each of our guests have the same great stay you enjoyed. Thank you for all of your suggestions. We are always looking for ways to improve our guest's experience. Thank you again for your review and thank you for choosing Cabins USA! I was disappointed that there was not internet service at the cabin. The hot water was not hot enough & the vertical blind in the living room was missing several slats. The location & hot tub were great. It was easy to get to & also convenient to the mall & other attractions. Thank you for choosing Cabins USA to celebrate such a special time! We work hard to make sure that each of our guests have the same great experience you enjoyed while vacationing in the Smokies. Our staff is always available and more than happy to help our guests in any way possible. When you are ready to stay with us again, please let our reservationists know you are a return guest for an additional discount. Thank you again for your review and thank you for choosing Cabins USA! We thoroughly enjoyed our stay, cannot wait to be back, have already recommended it to our friends. However, the tap water in the kitchen and bathroom smelled like rotten eggs and it was impossible to use. The cabin is secluded and very comfortable. We enjoyed the hot tub and being away from the hustle and bustle of downtown. We are checking on ordering the same bed for home it was extremely comfortable! Love the Smoky Mountains! Cloud 9 was a beautiful cabin.........the only negative thing I can say about this cabin is that the patio vertical blinds definitely need to be replaced. Half of the slats in the blind are gone and we actually had to hang a blanket over the patio door the entire 3 days we were there for privacy. Other than that the cabin was spotless and very well kept. Not only was the interior spotless, but the exterior was very clean and well kept. Thank you so much for your kind review! Our housekeepers work hard to make sure that each of our cabins are thoroughly cleaned and fully stocked so all our guests have to do is walk into their cabin and start relaxing. Thank you for letting us know about the patio blinds. We will definitely correct that issue. Thank you again for all of your kind words and thank you for choosing Cabins USA! Arrived at Cabin USA office and the booking process was great. Lyndsey is awesome! We wanted a quiet, restful, weekend and we accomplished that. Would recommend for 2 people who need to rest and relax. A little off the beaten path but we don't mind to be in the woods. Would book again. Thank you for your kind review! Our staff really appreciates being recognized for giving outstanding customer service. Our reservationists area always more than happy to help our guests find the perfect cabin! Thank you again for your review and we look forward to having you as our guest again! Perfect fit for two and a little one. We enjoyed that the location was just a few minutes from the main strip ,but far enough away to get a great mountain retreat. a little close to the other cabin but this one is the last on the hill so at least we could see the others but for the them they faced away from us so not to bad. A lot of bees inside the cabin not sure how they got in either. All in all it was a great retreat and would deffinatly use this company again. Parking is quite tight. We had a mid-size car and had a little difficulty getting in and out of the driveway - I'm not sure what someone in an SUV or truck would do. Cabin itself is perfect for two, but the layout is a kitten awkward. The front door is on the opposite side of the parking space, and unfortunately the outside lights on the deck weren't working. It made it a little tricky. The biggest downfall was a lack of wi-fi access. Thank you for your time review your stay with us. We will have the exterior lights checked, and we greatly appreciate all your feedback. We hope that we will back from you again soon. Do not forget to call about our return guest discount. This was our first time to the Great Smokies and we enjoyed our three days there immensely. The cabin was great and weather was perfect for a relaxing time. When we got there and checked the hot tub it was cool at 92 and we made a phone call in the morning and there was someone there right away to take care of it and we were able to enjoy it. King size bed was very comfortable along with two flat screen TV's and Direct TV. Nice hot showers too. Since we were on vacation,,, and just the two of us, we didn't take advantage of the kitchen facilities (microwave, stove, dishwasher, refrigerator, toaster) . Got lots of use out of the coffee pot for our morning wake up in the rocker on the deck. The only wildlife we saw was a turkey in the driveway and enjoyed the call of the birds and frogs. Would rent with Cabins USA again if we were in the area. Thank you for your review. We are delighted that you enjoyed your stay with us at Cloud 9. We apologize for any inconvenience upon arrival of the cabin, but we are delighted that maintenance was able to address the issues in a timely manner. We hope that we will see you again in the future next time you are in the area. Do not forget about our return guest discount. Thank you for your review. We apologize if you were inconvenienced this cabin did not have a washer and dryer. Please feel free to call us in the future and allow us to insure you pick a cabin that does offer a washer and dryer. We hope that we hear from you again soon. Me and my husband had a great time for the weekend at the cabinet to celebrate my birthday. Everything was great, except for the bedding. The mattress was uncomfortable and need to be replaced. Other than that, we really enjoyed the location and the quietness. Thank you for taking the time to write your review. We are delighted that you had a great weekend with us at Cloud 9. The mattresses have all just been purchased within the last 6 months; however, we will have the mattress inspected immediately. We hope that we hear from you again soon.